This lovely 1st floor apartment is set in a peaceful and quiet area amongst a complex of duplexes. It is south facing with stunning views (especially from the roof top terrace!). You can enjoy the sun all day long either from the private 1st floor balcony or the equally private roof top terrace/solarium. The communal pool is approx a 1 to 2 minute walk away, and is very attractively finished. The famous Villa Martin Plaza is a very pleasant 10 minute walk away which boasts a myriad of bars and restaurants to suit the most demanding of tastes! Here you will also find a small supermarket, bank, doctors the entrance to the golf club house. There are 4 more golf courses along with some truly stunning beaches all within a 10 minute drive. You will also find a vast selection of shops all within a short drive away. The apartment will suit golfers and families alike.There is FREE INTERNET at the also read our "Notes on Prices" in the Prices section.Thank you. We are a retired couple. My family and myself love the sunshine and the way of life this our property in the Canaries and our apartment in beautiful Villamartin. En-suite bathroom to bedroom 1 comprises of a white 4-piece suite, wash hand basin, wc and shower. Shelving and towel rails. Bathroom comprising of a white 4-piece suite with bath/shower over, wash hand basin and wc. Shelving and towel rails. The lounge consists of a large 3 seater sofa,42" flat screen satellite TV, dining table and ceiling fans-there is also free Wi-Fi available.Please enquire when booking.The sun terrace and large upstairs solarium can be accessed from this room. Fully equipped kitchen will satisfy most chefs! Includes electric hob and oven with extractor fan, washing machine, iron/ironing board, microwave, kettle, toaster, fridge/freezer with extensive range of utensils, cutlery/crockery. We are situated on the Villa Martin Golf Complex with a further 4 golf courses within a 10 minute drive. television excellent but tiled steps need a bit of repair. new man Simon excellent service helped us a lot. Thank you John for your comments.The tiles that you mention are outside in the communal area.Therefore we must wait for the community to repair the aforementioned cracked tile (only one)...which they will. We'd also like to comment that over the winter months our apartment will be having a total makeover. So should look and be in good shape for 2018. Had a lovely stay in this apartment, 10 minute walk away from plenty of bars and restaurants. Pool area was lovely and well maintained. Apartment could do with a little TLC . Roof terrace and balcony was dirty. Thank you for your comments...we welcome all comments - good (and yes bad).We're pleased to hear that overall you enjoyed your stay.We are grateful that you pointed out to us that the balcony and roof terrace had not been cleaned.We have now approached David and Shirley our caretakers to rectify the problem.As for TLC...well opinion is a very subjective thing...and indeed everyone in life has one ! Thank you both for your warm words...glad that you enjoyed ! "A very nice apartment ,located in a quiet area and close to shops,restaurants and the beach.Simon the caretaker has been very helpful.I highly recommend". Well thank you very much !...we have also rated you with 5* as guests :-)...Tres bien ! Which translated from German means " quiet location,suitable for families with children"...many thanks Mohamed.We've also rated you as a 5* guest.Thank you for looking after our apartment. 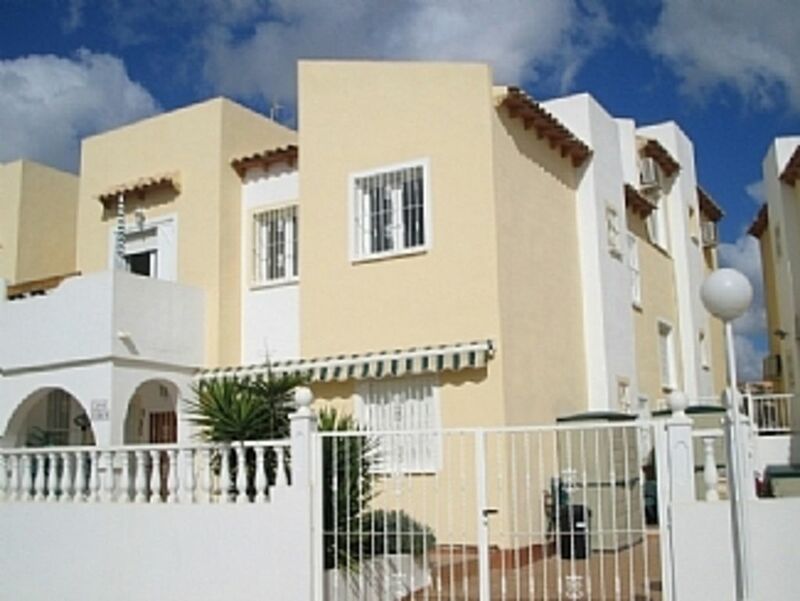 The lovely - and popular beaches of La Zenia and La Flamenca are an 8/10 mins drive away. But the 'Jewel in the Crown' beach of El Capitan is the one to see (and not known by many tourists), also a 10 mins drive away. Mmm...I'd like to be there now! All the beaches tend to be sandy and safe, really ideal for families and couples. 40 mins to Alicante airport. 15 mins to Murcia airport. Torrevieja is 15 mins drive. San Pedro a typical Spanish town is 10 mins. Orihuela with its famed Cathedral is 20 mins, with orange groves and mountain ranges right on your doorstep. San Miguel des Salinas is just a 10 mins drive and is typically Spanish with good bars/restaurants plus a vibrant market on a Friday. Booking Notes: Please see "Notes on Prices" section.Thank You. Changeover Day: Flexible. Notes on prices: Prices are for the apartment in UK £'s..discount available for 2 weeks or more.£125pw is charged for Jan(if your stay is for a minimum of 1mth ie £500 for the month) A 40% dep(non-refundable) is required upon booking with balance payable 8 weeks prior to departure..NB A charge of 55 euros (up to a party of 4)or 65 euros (for a party of 5 and above)is made upon arrival for the cleaning costs.This is a local charge and is taken into account and reflected in the reasonable rental price.Thank You.